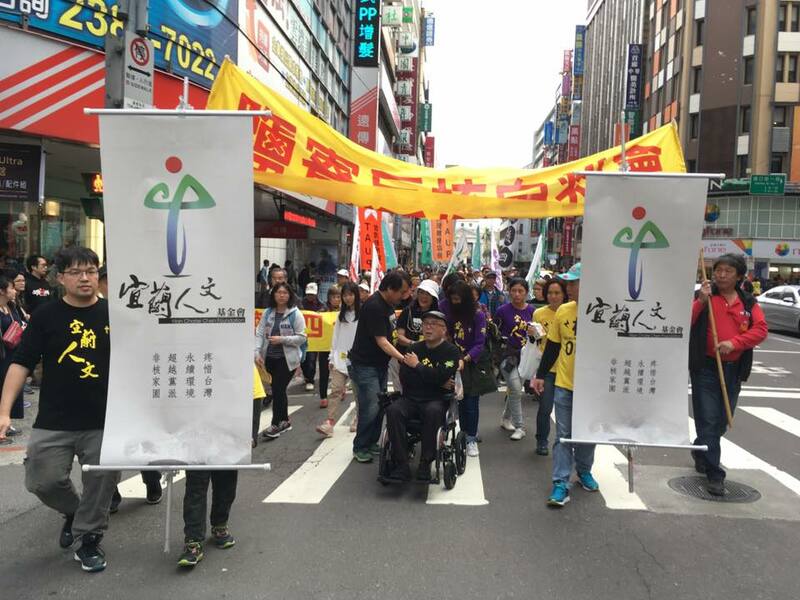 THE ANNUAL anti-nuclear march in Taiwan, commemorating the Fukushima incident in Japan, took place yesterday, with environmental groups, Third Force parties, youth activists, and other civil society groups marching through the streets of Taipei, Taitung, and Kaohsiung. 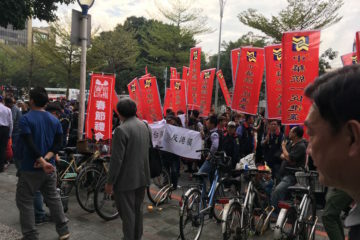 In Taipei, the demonstration began in Ketagalan Boulevard, in front of the Presidential Office Building, before proceeding to Ximending, through streets near Taipei Main Station, and then returning to Ketagalan Boulevard. 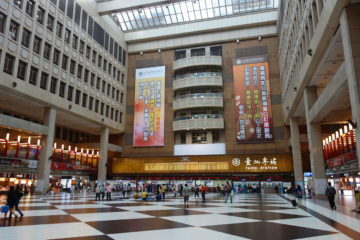 Police estimates were that one thousand demonstrators were in attendance in Taipei. Certainly not more than several thousand were in attendance, marking the demonstration as significantly smaller than anti-nuclear demonstrations commemorating the anniversary of Fukushima in previous years. Demonstration organizers previously announced that they expected over 100,000 in attendance, which was a reasonable estimate based on past demonstrations. 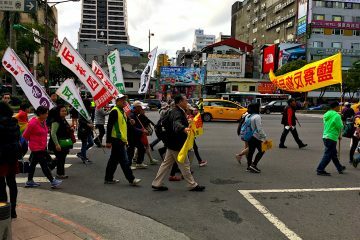 For example, the March 2014 iteration of the same protest saw as much as 200,000 come out onto the streets of Taipei, which was followed by an anti-nuclear demonstration in April which saw tens of thousands occupy Zhongxiao West Road in front of Taipei Main Station during democracy activist Lin Yi-Hsiung’s high profile hunger strike against nuclear energy. 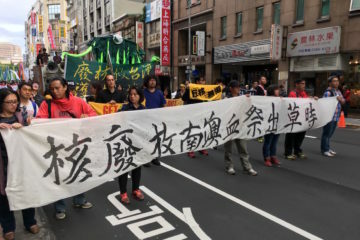 It may be that this year’s demonstration saw less demonstrators because Taiwanese society is currently satisfied with the Tsai administration’s promise to achieve a nuclear free homeland by 2025. 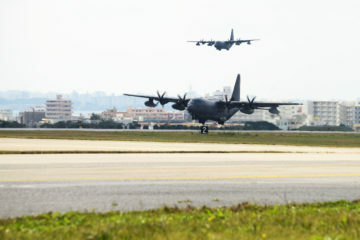 However, past administrations, including the Ma and Chen administrations, similarly promised to eventually realize a goal of phasing out nuclear energy in Taiwan. 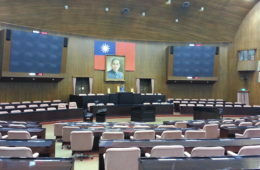 As demonstrators criticized yesterday, the Tsai administration largely has not provided concrete plan outlining the steps needed to be taken to achieve this goal. 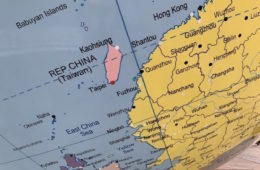 The claim that Taiwan will realize a nuclear energy free Taiwan by 2025 is still distant enough that the Tsai administration can eventually shrug off that goal and extend the timeline for phasing out nuclear energy down the line. 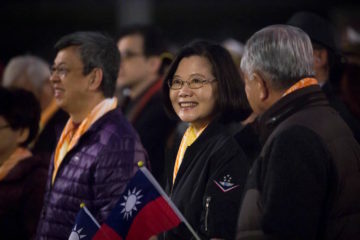 Notably, by 2025, the Tsai administration will no longer be in power and Tsai could potentially push this goal onto her successor. Demonstrators also called attention to the unresolved problem of that nuclear waste continues to stored at waste storage sites which are built without the consent of local residents, as observed in prominent cases as Orchid Island, in which the indigenous population of the island was deliberately misled about the construction of a nuclear waste storage site by the local government. 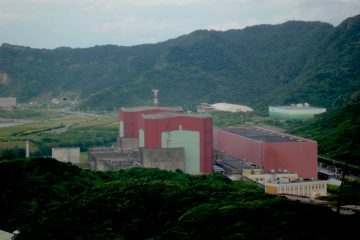 Whether on Orchid Island or elsewhere, nuclear waste is oftentimes stored in locations close to residential areas, including densely populated urban areas. 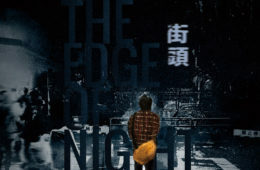 But more broadly, the issue of nuclear energy is not a dominant issue within Taiwanese political discourse right now, the way it was in previous years. 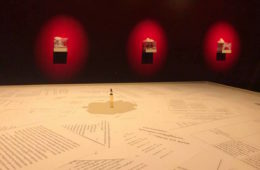 Nevertheless, as some civil society groups have suggested, it also seems likely that in previous years, because a KMT government was in power, opposing nuclear energy was also a way to voice protest against the KMT. 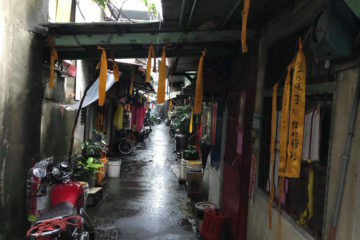 In the years leading up to the Sunflower Movement, for example, the anti-nuclear movement came to stand in for a broader range of issues concerning Taiwanese sovereignty, and the anti-nuclear movement was an important incubator for groups that were later active in the Sunflower Movement. 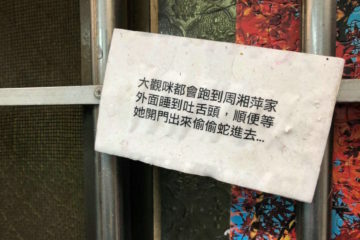 Now that a DPP government is in power and because the KMT is increasingly weakening, less are motivated to go out into the streets and protest. 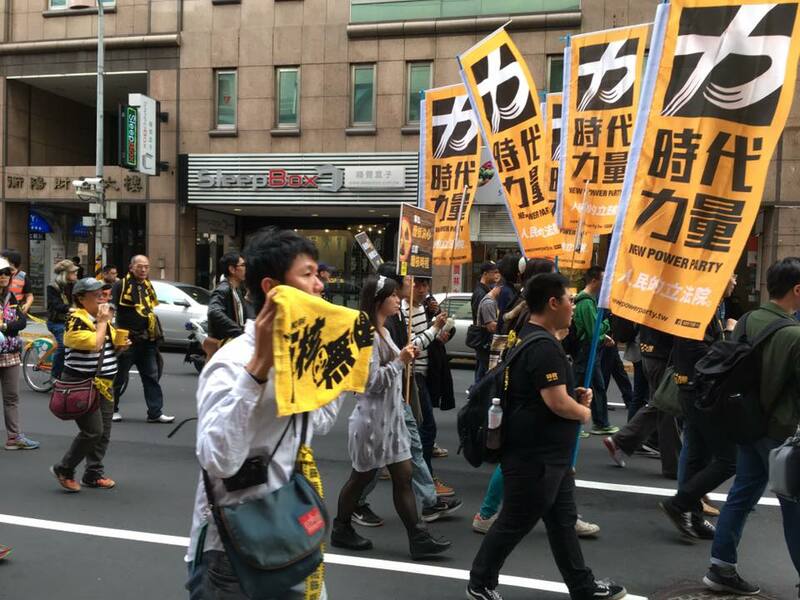 Indeed, in 2015, 60,000 demonstrators took to the streets for the commemoration of the Fukushima incident across Taiwan when the Ma administration was still in power, with 40,000 demonstrators in Taipei alone. But 2016 only saw 7,000 demonstrators in Taipei, seeing as the march took place shortly before the Tsai administration was set to take power. Indeed, groups present today are largely groups who have been active in the issue through multiple transitions in power. 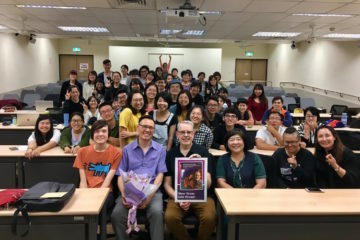 The Taiwanese anti-nuclear movement has a long history bound up with the history of democratization, serving as a vehicle to voice critique of the KMT during the transition to democracy in Taiwan, but it has seen ebbs in the past after transitions of political power. 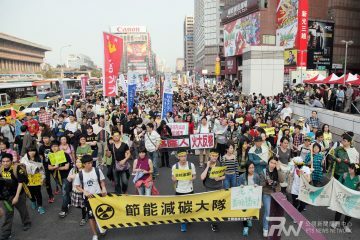 The contemporary Taiwanese anti-nuclear movement is largely a post-Fukushima development which arose after the 2011 Fukushima incident in Japan, even at some points mobilizing larger numbers of demonstrators than anti-nuclear demonstrations in Japan itself probably due to the particular valences of the Taiwanese anti-nuclear movement going back to the history of Taiwan’s democratization. 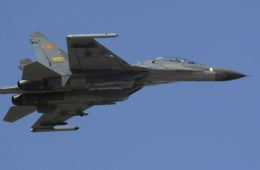 The anti-nuclear movement of decades past saw decline during Chen Shui-Bian’s presidency, with a drop in mobilization capacity, although veterans of the anti-nuclear movement from decades past remain active participants in the present anti-nuclear movement. 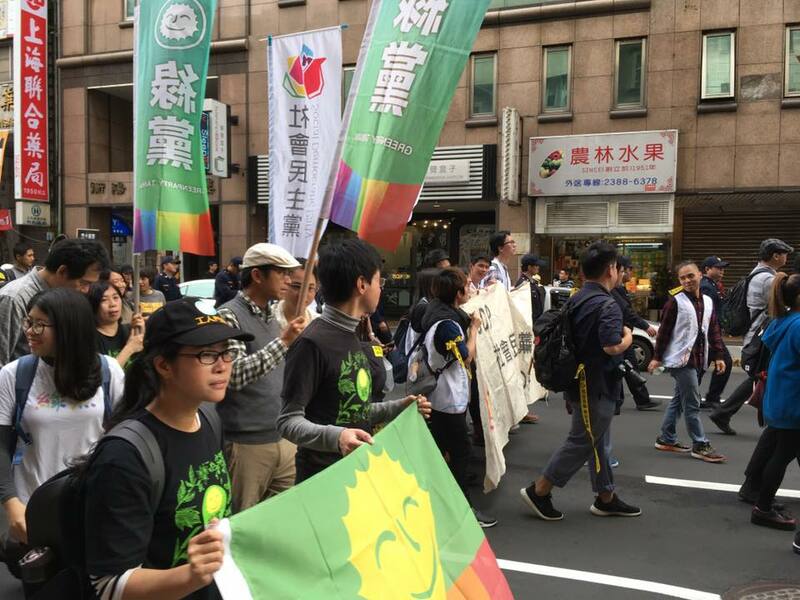 The fact that Taiwanese civil society and youth activism continues to largely stand for the same, broader set of issues was evident today in that many of the groups present at the demonstration today do not directly concern themselves with nuclear energy or environmental issues. 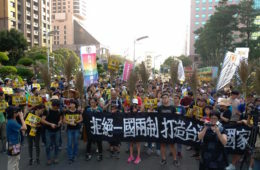 Apart from Third Force parties as the New Power Party and Social Democratic Party, present also were groups as the prominent LGBTQ advocacy group, the Taiwan Tongzhi Hotline, indigenous demonstrators protesting the failure of the Tsai administration to return indigenous traditional lands, teacher organizations, and other groups. 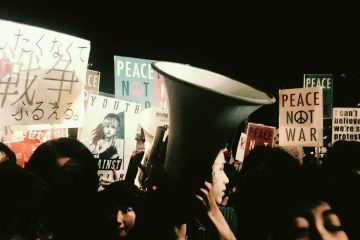 The anti-nuclear movement continues to be one which unites Taiwanese civil society and youth activism. 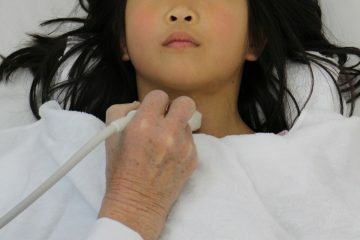 As for steps going forward to call on the Tsai administration to concretely realize its promises of phasing out nuclear energy, that still remains to be seen. 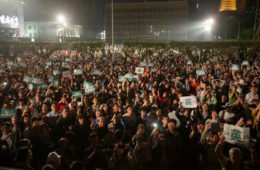 Today’s demonstration proves a show of force to illustrate to the Tsai administration that civil society groups have not forgotten the Tsai administration’s promises to phase out nuclear energy and that, in spite of a decline in participation, these groups will continue to carry on the flame for the anti-nuclear movement writ large. However, we shall see as to the responses of the Tsai administration, if any are forthcoming, or, as with previous presidential administrations both KMT and DPP, if the promises of the Tsai administration will prove to be more than just empty promises.